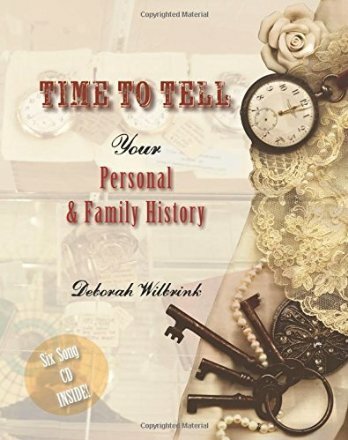 Deborah Wilbrink of Perfect Memoirs knows how to get to the story, and shares that skill with readers in Time to Tell Your Personal & Family History, which she published in January 2016. The book is equally useful to the personal historian or the individual wanting a do-it-yourself approach to family history or a personal memoir. Several attributes set this book apart on the growing shelf of books that serve the increasing interest in preserving personal and family history. This is the first book I’ve seen that goes “multi-media” with companion songs . The lyrics are in the book. The original songs, in an Americana-Folk-Bluegrass style that reflects Deborah’s Nashville location, are available for download. The songs were written by Deborah and recorded by Nashville musicians. Through her tips and her clients’ examples, we learn to tell difficult stories, apply a structure, blend in creative artforms, employ objects as prompts, and share lessons learned without being heavy-handed about it. In the concluding chapter, Deb shows us how connecting with other people helps you learn the skills you need, get the job done, and celebrate completion together. I particularly like the way Deborah incorporates excerpts from her clients’ stories to illustrate the topic of each of the six chapters, and not just because I’ve been thinking along the same lines for the next book I intend to write. Time to Tell is an engaging experience from a knowledgeable author, filled with practical tips and inspiring suggestions. Because of the stories included, this book would make a good gift for Mother’s Day or Father’s Day. There’s plenty to entertain a loved one and lure him or her to consider writing or recording a life’s stories. Sarah White shares her thoughts about the book I wrote to help YOU capture your life story, or family stories.